TradCatKnight: FreeMasonry, The Synod & "Poo-Poo"? I can now report that during the Morning Session discussions of Group A (Italicus) on October 8th, 2015, the influence of Freemasonry was raised. The incident was recorded by Archbishop Stanislaw Gadecki on his blog. The fact that Synod Fathers are raising the issue of Freemasonry helps explain the blasphemies, the heresies, the cloud of dark confusion and evil that surrounds the machinations of a group of churchmen intent on overturning the unchangeable teaching of Our Lord Jesus Christ on Holy Matrimony and human sexuality. 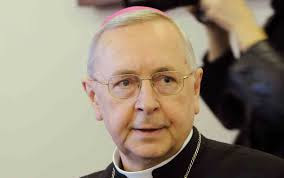 Specifically, Archbishop Gadecki noted that there were Synod Fathers in Italicus A who were concerned that the spirit of masonic influence had infected sections of the Instrumentum Laboris. 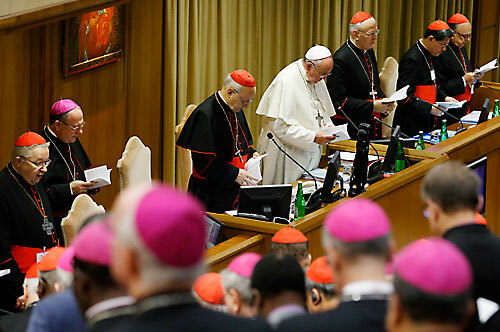 The document — officially called an instrumentum laboris — also fell short, “especially in its theology, clarity, trust in the power of grace, its use of Scripture and its tendency to see the world through overwhelmingly Western eyes,” the bishops said Friday. Other than that Mrs Kennedy, how was the parade? The news seems to be all good today, as the National katholic distorter reported that the bishops also concluded that they have no idea how the Pope thinks the public expressions of apostate bishops is helpful to families trying navigate their loved ones through this unprecedented period of diabolical disorientation. Here's today's first place blue ribbon for stupidity: Cardinal Tagle said it's good for bishops to confuse their flocks because if Church teaching is taught with clarity, they might not be living real lives. And with those crystal clear instructions, Irish Bishop Eamon Martin did us all proud. 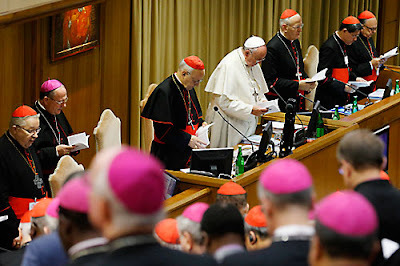 "Like Vatican II, this Synod needs to be a language-event, which is more than cosmetic," they stated. "We need to speak of marriage and the family in new ways, which has implications on both the macro and micro level, as it does on both the local and universal level." Conciliarist "newspeak"...Oh brother when will the conservatives wake up and realize Vatican II was not Catholic? Time for true restoration! the unchangeable teaching of Our Lord Jesus Christ on Holy Matrimony and human sexuality.